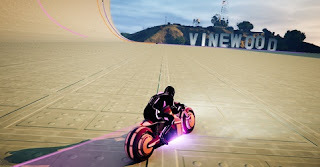 In the beginning of November 2016, the new Deadline mode was added to the game, where you can sit on a fluorescent Nagasaki Shotaro and feel a bit like Tron. The entire Deadline mode is modeled on the film from the 80s and its continuation from the year 2010. In this guide, you'll learn how the deadline mode works and also we will give you some useful tips and tricks. In the film the performers are promoted to a grid in a cyber world and fight for power, identity, manipulation and justice. The main character Flynn is to take part in various games, where he is to be unlocked and the so-called "light racers" appear. The principle behind this is as follows: You will get a motorbike for the deadline mode, the Nagasaki Shotaro, which has the typical varnish with neon colored light stripes as in the film "Tron". Of course, your character also has a stylish motorcycle. While driving in the arena, you will move past a temporary light trail that has the color of your Nagasaki Shotaro. You must neither touch nor cross the light line of an opponent or your own, to avoid certain death. Basically, Deadline is a competitive mode, a classic competition. Deadline requires a good combination of planning, driving skills and quick reflexes. The goal is to get your opponents to enter the line of light that you are pulling behind you or with your motorcycle. A game round takes between 5 to 15 minutes. You have the choice between different arenas. One of them is shaped like a huge basin, with walls leading upwards, which can be raised. Here, everyone can avoid quite well. Other arenas are equipped with various obstacles such as blocks of houses or ramps that require additional attention. - Boost: You get a speed boost and you can use it to cut someone off directly. - Zone: You slow down the time and can better avoid a light line. - Hop power-ups: You make a jump and you could dodge by jumping over the light strip. The power-ups don’t consume until you use them. Just activate it with "E" and keep the map in the bottom left. Here you can see the power-ups, but also the other drivers. - Death Match: A classic principle that goes according to time. Who makes the most kills? - 5 to 40 kills can be set. - Last / Sole survivors: Between 2 and 10 lives can be placed here. Whoever is the last on the map wins. By the way, there is a so-called Sudden Death, if two players have the same level of kills or lives after the end of the time. Then the arena becomes smaller and smaller, until it is compelled to come to an end. - Spawn-protection: the first 3 seconds after the spawn you are "invulnerable" (spawn protection). Then your character flickers. So you can get to know where the others are. - Viewing angle: Use V to change the view First-Person / Third-Person. You can set the camera perspective as the host. - Try to cut the opponent somehow. The best way to do this is by overtaking him and turning him straight into a sharp turn. - Use the brake to avoid or even to take a tight turn in time when someone drives you right in front of the wheel. You slow down as you go from the throttle, just like in normal driving. - Motorcycle rams: You don’t die the same way when you drive the other driver directly motorcycle to motorcycle, but only if you cross one of the colored light streaks. - Area overshoot: Also, be careful not to fall off the map, because you are dying. Theoretically, however, your opponent's drivers could also push the map for this reason. - Don’t stop: By the way, you cannot stand completely or hang out somewhere, you also fly into the air. - Light line disappears: As soon as someone dies, his light trail disappears and you will be safe. - Own light strip: You should not drive into your own strip, for example, if you go a loop or circle. On the other hand: If you are encircled and do not have a chance to make a meaningful dodge, then go in your own light streaks, you die, but does not give the other point. - Head to head: Eliminate head-to-head racing. Drive away, get out and grab him. If the other has a sprint boost or can take the turn faster, he just goes into the track with a slight swing and you lose the match. - Be clever: Avoiding confrontations and let the others simply kill each other. This is particularly useful in the variant "Last Survivors".